For more than 30 years the American Council on Germany has engaged farmers, agricultural experts, and policy makers on either side of the Atlantic in exchanges to discuss common challenges in agricultural policy. The McCloy Leadership Mission on Agriculture, Food Security, and Resource Scarcity is designed to give practitioners the opportunity to come together with their transatlantic counterparts. 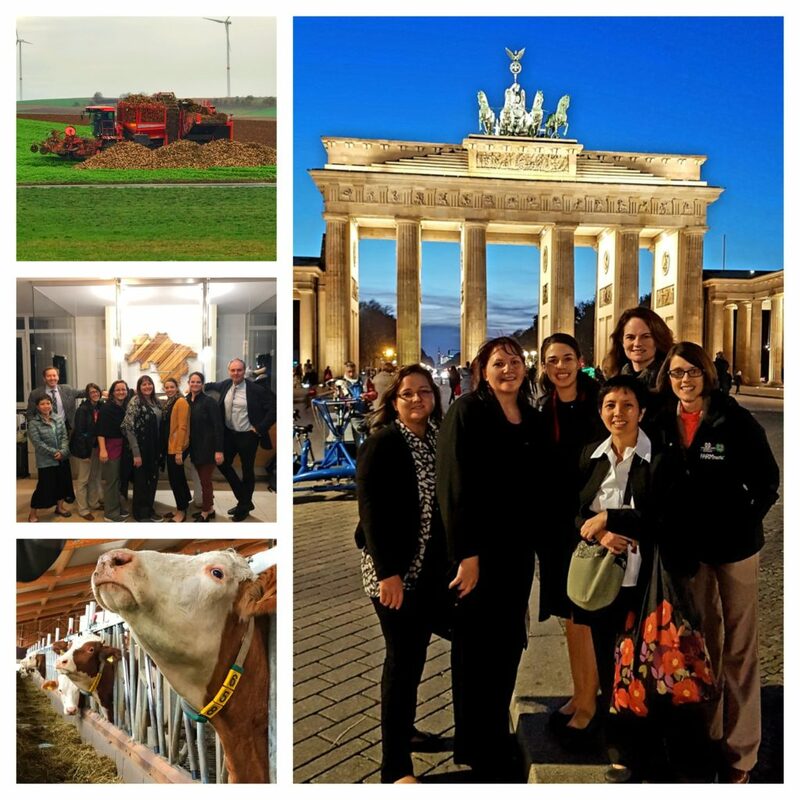 From November 4 to 16, six American agricultural experts traveled to Germany to exchange best practices with their German peers. The group consisted of: Kalena Bruce, fifth generation cattle farmer and Certified Public Accountant from Stockton, Missouri; Shannon Douglas, farmer (cattle, corn, and specialties crops) and owner and operator of CalAgJobs from Orland, California; Joni Kamiya, second generation papaya farmer andOccupational Therapist at Sundance Rehabilitation at Pohai Nani from Kaneohe, Hawaii; Rosella Mosby, owner and operator of Mosby Farms from Auburn, Washington; Valerie Wagner, Coordinator for Commonground North Dakota from Monango, North Dakota; and Julie White, Extension Associate at Mississippi State University Extension Service School of Human Services and Coordinator for statewide agricultural literacy program, FARMtastic, from Starkville, Mississippi. Together with the Deutscher Bauernverband, the ACG organized this 12-day fact-finding mission to Berlin, Bremen, Brussels, Hanover, Munich, and Würzburg to discuss farming and agricultural policy. Drawing on its strong network of experts throughout Germany, in each city, the group was hosted by members of the Bauernverband and alumni of ACG programs. From their arrival in Berlin, the group addressed sensitive issues in the agriculture industry today, such as genetically modified foods, resource scarcity, and technological developments. Hosted by Christian Gaebel (2015 McCloy Fellow), Officer for Agricultural Policy for the Deustcher Bauernverband, the group spent three days meeting with policymakers and government officials. While in Berlin, they met with Bundestag member Hermann Färber (CDU) (2008 McCloy Fellow), who actively works to protect the needs of German farmers. In Lower Saxony the group was hosted by Jörn Ehlers, (2017 McCloy Leadership Mission), Vice President of the Landvolk Niedersachsen, for tours of food processing facilities, farms, and biogas plants. Many of the conversations focused on sustainable farming and renewable energy, as well as government regulations and trade agreements. The cohort also met with Cornelia Berns, Head of Division for International Trade at the Federal Ministry of Food and Agriculture; Marieke Meyn, (2016 McCloy Fellow) Policy Advisor at the Andreas Hermes Akademie Plattform Ländliche Räume; Dr. Anni Neu, (2005 McCloy Fellow) Editor for Deutsche Bauern Korrespondez; and Dr Jürgen Weis, Head of Agriculture Division for the German Representation to the EU. They also visited the U.S. Embassies in Berlin and Brussels, the Reichstag, the European Parliament, and the European Commission. Special thanks to the Deutscher Bauernverband and the American Farm Bureau Federation for supporting this program.